Amazon Kindle Fire Price To Drop This Year? The rumors are flying hot and heavy. They say that Amazon will soon drop the price of their Kindle Fire tablet to $149. Where are these rumors coming from? And could there be any truth to them? It will not come as a surprise to our regular readers that DigiTimes appears to be the source. The Taiwan-based rumor mongering site gets a bad rap at times, but darned if sometimes they don’t get it right. DigiTimes says that its sources in Amazon’s supply chain say the big retailer plans to launch a new 7 inch tablet along with new e-book readers during the third quarter of this year. The sources suggest that Amazon will follow Apple’s lead and drop the price of the previous generation tablet when the next-gen launches. What will the next-gen Kindle Fire look like? The only thing mentioned is a higher screen resolution of 1280 by 800 (the current Fire is 600×1024). The say the price will be $199, and that Amazon will continue to market a tablet ‘similar’ to the existing Kindle Fire for $149. 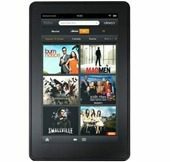 You may recall that back in May we told you that Amazon may come out with a larger size Kindle Fire. DigiTimes is reporting that development of an 8.9-inch has stopped, but Amazon is continuing work on a 10.1-inch version. They also reported that Amazon is working on a 6 inch backlit e-reader for release during the third quarter at the earliest. No doubt that it will be designed to compete with Barnes & Noble’s popular Nook eReader with Glowlight.